New York, NY – August 17, 2018 – Baron Walker, featured in the award-winning documentary MILWAUKEE 53206, has received parole and was released today in Milwaukee, after serving more than 22 years in a Wisconsin prison, Odyssey Impact™ announced today. Walker grew up in zip code 53206, which incarcerates the highest proportion of African American males in the nation – up to 62% have been imprisoned by age 34. His plight and more are explored in the thought-provoking film by Transform Films Inc.—the production company affiliated with Odyssey Impact—which uses personal stories to take an intimate look at the crisis of mass incarceration and the devastating toll on families and communities. For the past year, Odyssey Impact has conducted a social justice impact campaign around the film, holding hundreds of screenings with an array of partners to engage with various communities and inspire social change. Directed and produced by Keith McQuirter, MILWAUKEE 53206 chronicles the harsh reality of those living in the U.S. zip code with more than half the black men imprisoned and removed from the community. It explores the high cost of excessive sentencing and mass incarceration on individuals and families, and the challenges these men face upon re-entering society. The documentary has garnered acclaim at film festivals and premiered on the public television series America Reframed in April 2018. The film also spotlights the thousands of prisoners currently being held in the Wisconsin prison system who are eligible for parole—up to 3,000 of the state’s 22,000 incarcerated. Like Baron Walker, these inmates were sentenced in the last century, prior to the 1998 Truth In Sentencing legislation. Many have served the legal time requirements set forth by the old law and their sentencing judge. These men can sometimes serve up to double the time as those who commit the same crimes but are sentenced under the new law. 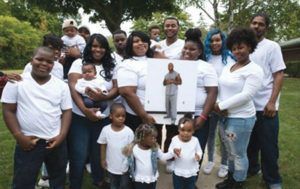 Now 44, Baron Walker was a young man when he was convicted of being a party-to-a-crime in two armed robberies in which nobody was physically harmed. He was sentenced to 60 years in prison—35 years and 25 years, to be served consecutively. Caught between changing parole laws in Wisconsin, he should have been released years ago, but has been denied parole seven times. Walker was sentenced under Wisconsin’s old law but has been held to the new law’s standard. The film also follows his wife Beverly Walker, mother of five, who has worked tirelessly toward his release. With the mission to inspire social change through the power of film, Odyssey Impact and its production company Transform Films build and execute social impact campaigns to inspire people to engage with important issues, such as mass incarceration, poverty, gun violence, intolerance, hate crimes, racial justice, and gender violence. Beginning in May 2017, Odyssey Impact launched a social impact campaign for MILWAUKEE 53206, and has been working with faith communities, government agencies, advocacy groups and nonprofit organizations to host screenings to help draw attention to the need for parole and sentencing reform in Wisconsin and other areas. In the state of Wisconsin, 150 community screenings of the film MILWAUKEE 53206 have been held, and a total of 217 screenings so far in the United States. Two screenings were held at the State of Wisconsin, Department of Corrections, organized by a Corrections Field Supervisor, to help those working in the prison and parole system understand the issues, and another screening took place at the Wisconsin Public Defender’s Office. Together, these outreach efforts have helped raise awareness about racially-biased, excessive sentencing and the need for parole reform in Wisconsin and beyond. They have also brought state-wide recognition to Baron Walker’s case. Odyssey Impact has also engaged faith leaders interested in social justice and criminal justice reform and has sought to organize them to expand on how mass incarceration is framed—to include an ethical crisis overwhelming families and destroying communities. In the past year, the film has been shown by faith communities, Christian churches and universities, theology schools and seminaries, Jewish organizations, and interfaith groups around the state and the country, which has helped enlighten people with a better understanding of the issues around mass incarceration. After viewing the film, several screening partners and audience members felt compelled to support the families and communities of the incarcerated. Some were so moved by Baron and Beverly Walker’s story they began letter-writing campaigns within their communities. One such partner was a Candler School of Theology student based in Atlanta, Georgia, who organized a public screening of the film at Emory University. Following the screening, audience members were given a call-to-action to write a letter of support to the Wisconsin Parole Commission advocating for Baron to be released on parole. Ultimately, a high-powered attorney saw the MILWAUKEE 53206 film, took on Baron’s case pro-bono, and filed motions to secure his parole.